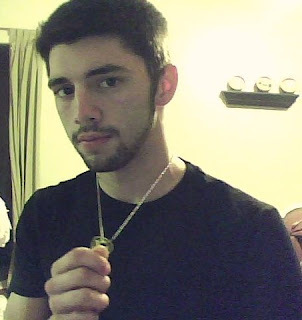 My heart has been hurting the last few days after finding out about the loss of my son Cole's Uncle Richie. We were in Southaven, Ms. when we found out. Cole's sister Rachael had tried to get in touch with us but I didn't get the voicemail until 2 days later. The way we found out about it was when my daughter was looking at her 'myspace' and one of her friends had it on their page. We found out right before we were going to Cole and Shanna's baby shower. We didn't tell Cole until that night because we didn't want to tell him before the shower. Christy and I decided to stay another night at the hotel so that we could be there for Cole when we told him. This has really hurt Cole and I am so glad that we were there for him. He and Richie were close. They sent messages back and forth on their myspaces often. This was the only picture that I had of Richie. He was only around 14 years old here holding Cole and with his arm around me. Everyone always called him "Richie Rich". He was only 32 years old. He has a precious little girl...Haley Gabrielle. Tomorrow is his funeral. Cole is so upset that he can't come. His mother and I have always been close and always will be. I never married her son (Cole's dad) but she has always been like a mother-in-law to me. She is my friend and I love her. Please pray for her and her husband as they go through this painful time. Today was Cole and Shanna's baby shower. My daughter and I came here to Southaven, Ms. to attend their first shower. This is a photo of them with their cake. The above picture is of the cake. His name is going to be Gabriel Zane. He is due around Thanksgiving. Me, Cole, and Shanna. I can't believe that my little boy is going to be a daddy! This is one of the outfits that I bought for Gabriel. 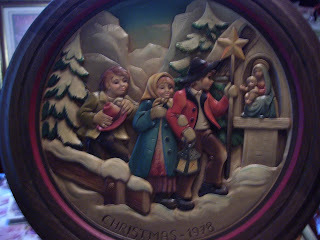 It is 'Christmas' p.j. 's with a little bathrobe. Christmas is my favorite holiday and when I saw this outfit, I just had to get it for them. They really had a great shower and received so many nice gifts. They were so excited! My little grandson Jason is on the left playing with a balloon. The shower was held at Shanna's Aunt Pam's house. Cole, Shanna, and me after the baby shower. I didn't get very many pictures on my camera because my memory card ran out of room. LOL My daughter got a lot on her camera but we can't download her pictures because her memory card won't work with my laptop. I'll have to download those whenever I get back home. I didn't get any of my daughter on my camera. I used her camera to take them. This is one of the games that we played. Cole had to come out looking like he was expecting! 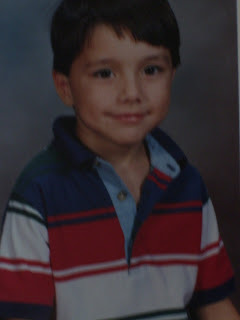 Wasn't he cute? Everyone had to guess how much he weighed when he was born. No one got it right! LOL He weighed 7lbs. 12oz. He looks so funny holding his aching back! Look at them comparing bellies! How cute!!! Our trip here was suppose to take around 3 or 4 hours but we stopped and ate in Jackson and went to Target and shopped for 2 hours!!! We lost track of time buying all of those baby gifts. We are staying one more night here in Southaven and then heading home. My vacation is almost over. I start back to work on Monday. It has been a very busy vacation for me. But I enjoyed it. The only thing that I really got done around my cottage was painting my brass bed. I put 1 coat of paint on it before I left and I will put on another when I get back home. I got tired of the brass finish . I painted it a pretty off white. I can't wait to get it back in my bedroom and put my new quilt on it. I love this one because of the red in the leaves and the sun shinning through the trees. The song that I have playing is by Eva Cassidy. Her voice was so beautiful. I love this one because of the swans. I have always loved swans. This picture reminds me of the movie...The Notebook. My all time favorite movie and book. 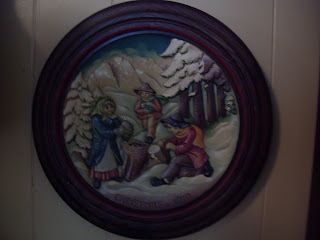 This one reminds me of a time when I was a little girl when I visited my Uncle James and Aunt Martha. 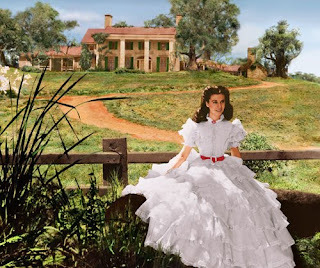 They lived out in the country and it actually looked like this at their house. I love this one because of the lane going through the woods...where is it leading? Probably a cozy little cabin on a hill. I can just imagine the kids playing in these leaves. They would have a ball. This looks like I'm looking out a window at the pretty lake. Wouldn't that be wonderful to have in my backyard outside my cozy cabin? I'm dreaming now. The leaves on these trees look like fire. I love them against the white fence. This would be wonderful to come across in the woods. It reminds me of a little chapel. It would be a beautiful place to go and read and study my bible or just talk to God. I love Autumn. It is my favorite season of all. God is so good. 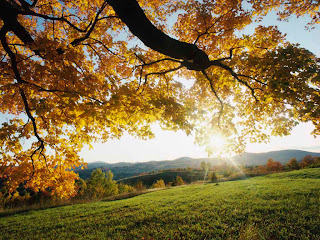 He gives us these different seasons for us to enjoy. I hope you enjoyed these pictures and the song. Thanks Rhondi for hostessing this Fall Party. 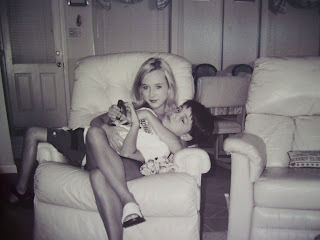 These are some old pictures of my little brother and me that I ran across the other day. 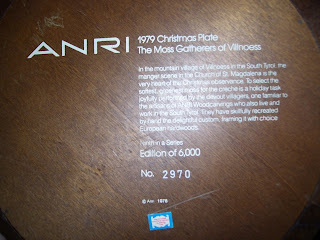 I took pictures of pictures to get these to be able to post them. His name is Robbie and I was always the little mother to him when he was little. I taught him how to read whenever he was around 4 years old. We played school all of the time. I'm 3 years older than him. We were in our 'play clothes' here. I always loved to wear dresses. 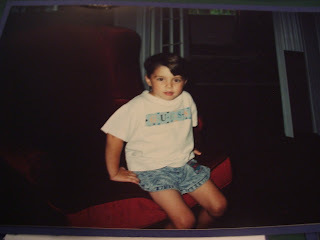 He was 3 years old here and I was 6 and he was a handful! 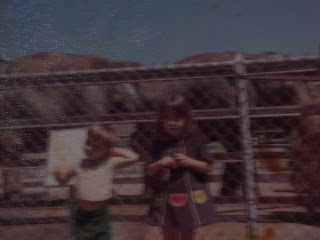 This is us at the zoo in front of the elephants. We were in Tennessee at Rock City Gardens. I always loved seeing the elephants even to this day. 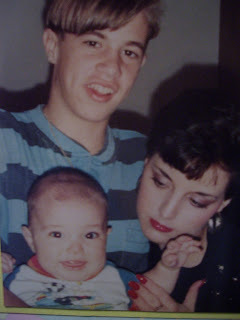 Robbie, me and mom. Daddy took this picture of us before we went into the gardens. 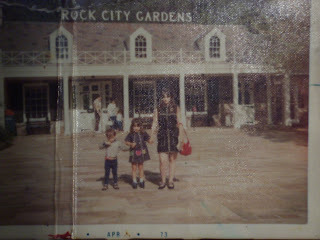 My mom sure was styling with her short black dress and big red purse. Wasn't she pretty? 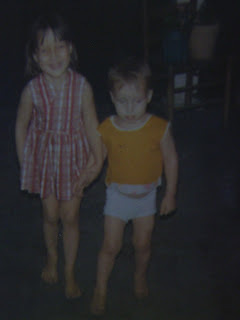 Look how I had a hold of my little brother's hand!!! He wasn't getting away from me! These pictures have a date typed at the bottom of them. That is not the date that they were taken. That is the date that they were developed. Mom probably had them for a while before she had them developed because my little sister was born in August of 1973 and I am 7 years older than her. I just love looking back at old pictures. 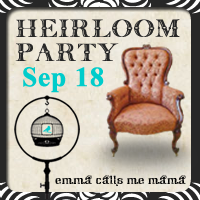 Today is the Heirloom Party at Marie's from the 'Emma Calls Me Mama' blog. Go visit her blog for all of the other Heirloom party links. 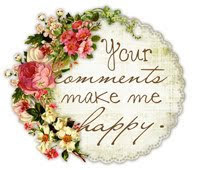 You will love her blog. 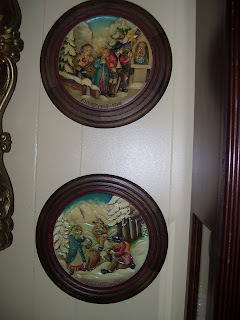 I wanted to share these beautiful Christmas plaques that my daddy gave to me years ago. I was around 19 years old at the time and he knew that I would love them. I've used them all of these years in my Christmas decor. They have so much detail to them. They are dated 1978 and 1979. 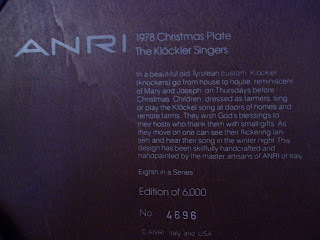 I took a picture of the back of them. They were made in Italy and the USA. I love them. Don't you just love them too? The design looks like it is carved. This is the two of them hanging on my wall in my living room. I left them out all year long this year. I usually pack them up. Oh well...now I wont have to unpack them in a couple of months! I told my daddy that I still have them and he was a little surprised and then he said..."I know, you keep everything!" LOL One day I will pass them down to my daughter. I know that she will love them just as I have all of these years. I'm still under the weather. I feel a little better than I did yesterday though. 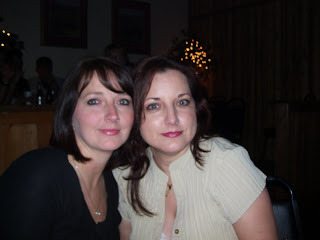 This is a picture of me and my sister taken the night before I got sick. I was not feeling well here either. I had a bad sore throat and when I got home I had a bad headache. My face was even swollen. I almost didn't go down to see her but I had promised. We don't get to see each other very often and I'm glad that I went. We went out to eat and we had a good time together. Next week we are planning a girl's day out to go shopping together! I'm going back to work tomorrow. I can't afford to miss any more days. Next week is my vacation! I can't wait. I have so many projects to do around here. It is 6:00 p.m. and I haven't been awake for very long. I think that I might have the flu. My whole body hurts and my throat is very sore. I've had a sore throat for a couple of days but this morning when I woke up I could barely even swallow. My head hurts and I have a low grade temperature. I called the ER and they said that it was probably the flu and not to come up there because they were overcrowded with people with the flu. They said to stay home and not go to work or around other people. The flu is really going around here in my town. My grandson is sick also. 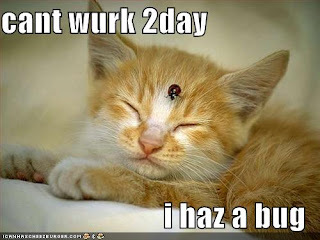 I stayed home from work today and took medicines and slept all day long! I can't believe that I slept this long... I decided to check my blog and realized that I haven't posted since Monday. I hope that I feel better soon. 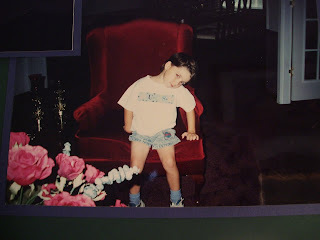 I have always loved going to dances or balls! 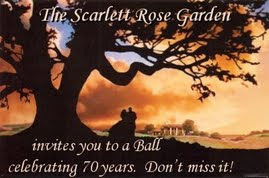 I have been invited to attend Nikki's "Gone With The Wind" ball to celebrate the 70th anniversary of the movie. Nikki has a beautiful blog called "The Scarlett Rose Garden". 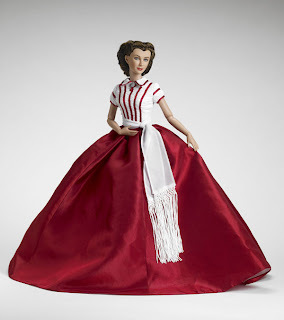 She has a huge collection of GWTW costumes, dolls, etc. I was so happy when the invitation arrived! I was sitting out by the fence whenever the postman rode up on his horse to deliver the parcels. I like to sit out there and wait for him...I'm always eager to get the mail and talk to him and catch up on any new 'news'. Most of the time I have a nice glass of sweet tea ready for him and a pail of water for his horse. He has such a long day delivering the mail. 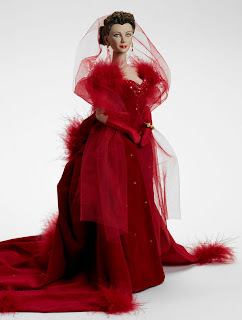 I now have to choose the gown that I will wear to the ball! What fun! 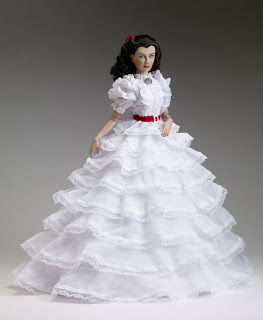 Should I wear this white one with the red sash? I've been in a red mood lately. Thank you Nikki for inviting me to your ball. 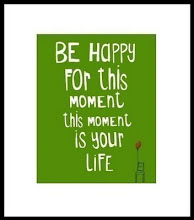 I know that I will have such a wonderful and delightful time! Last night I was feeling a little down. Just missing my son Cole. He called me last night to 'check in'...that's what he calls it. He wanted to tell me all about his job and let me know how Shanna is doing. They are doing fine and have been busy looking for an apartment. 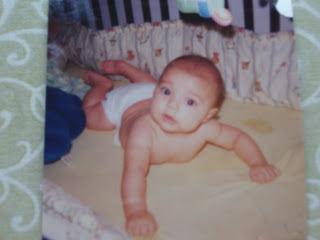 The picture below is Cole when he was just a baby. 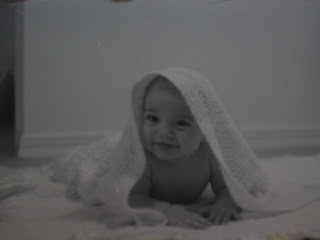 I put his blanket over his head because I wanted the picture to look old fashioned. I love this picture. This is another favorite of mine. He was around 5 months old. This is a picture of Cole and Christy at his grandma and grandpa's condo in Bay St. Louis. (The condos are all gone now...thanks to Katrina!) You can just see the love in their faces for one another. He was so handsome here. This was his school picture. These next two are a couple of my very favorites of Cole. He has been on my mind a lot lately. I had been thinking about them and wondering if they were getting all settled with his new job. I know that I'm not suppose to 'worry' and I try not to. I know that God is watching over them. Cole must have known that I had been thinking about him...he called me last night and I didn't recognize the number. When I answered it, he said "Hey, Mom...just 'checking in' and to let you know that I have a new phone. I love you." That made me feel so special. He told me all about his job and that he has to leave at 4:00 a.m. and be at work at 5:00 a.m. He is really trying to get his feet off the ground and make a home for his soon to be family. He sent these pictures to my computer to let me see how he is doing. He knew that they would make me feel better. Here he was showing me something that he was snacking on. 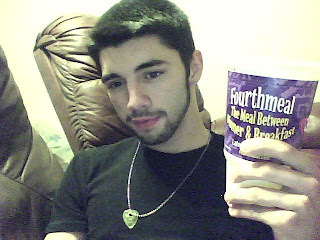 Its called a 'fourth meal'. It says on the package "The meal between dinner and breakfast". He wants to reassure me that he is eating! LOL I thought this was so funny! I feel so much better after talking to him and seeing these pictures of him. Isn't it amazing what we can do with computers? They were going to watch a movie that they had rented. I told him that I was fixing to do the same. We had both rented the same movie! Now I have to get dressed for work. Today should be a very busy day. We have a huge Labor Day sale going on.